It turns out that watching paint dry isn’t as pointless as it seems. 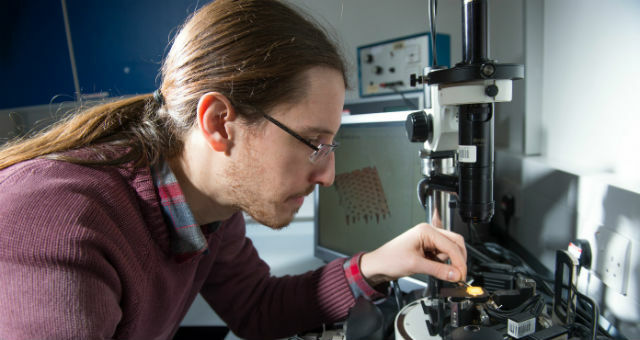 Researchers at the University of Surrey in England, collaborating with the Universite Claude Bernard in Lyon, France, report they have identified a new physical mechanism that separates particles by size during the drying of wet coatings. That doesn’t sound ground-breaking, but it could make a huge impact in a variety of industries from beauty to agriculture. Andrea Fortini, the lead author of the paper published in the journal Physical Review Letters, said when coatings such as paint, ink or even the outer layers of tablets are made, a liquid containing solid particles is spread onto a surface, and then evaporates. Co-author of the study, Nacho Martín-Fabiani, prepares a paint sample for analysis with the Atomic Force Microscope. The new discovery indicates it is possible to design coatings with layers that have different functions. Sunscreens for instance, could have a top layer with smaller sunlight-blocking particles, and a layer with adhesive, larger particles closer to the skin. The scale is microscopic—usually the particles used in coatings are 1,000 times smaller than the width of a human hair—but researchers are confident their work can be used across multiple platforms. The team is trying to control the width of the layers by changing the amount of small particles in the coatings. Possible applications for the new mechanism include products such as paints, inks and adhesives. The research is funded by the European Union project BARRIERPLUS, which focuses on the reduction of volatile organic compounds in paints. Editor's Note: The story was updated March 29 to correct particle size mentioned in the sunscreen example.